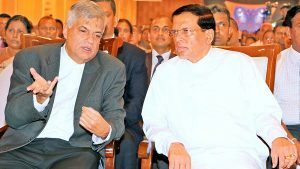 It has been revealed that a confrontation has broken out between President Maithripala Sirisena and Prime Minister Ranil Wickremesinghe to get additional funds in addition to the estimated amount allocated for Moragahakanda and Kaluganga projects say reports. On 27th March 2018 Prime Minister Ranil Wickremesinghe, in his capacity as the subject minister of National Policies and Economic Affairs presented a cabinet paper to get US$50.5 million from Saudi Fund for Development to carry out certain restoration works in Kalu Ganga reservoir. This was approved by the cabinet. On 14th November 2017 Prime Minister Ranil Wickremesinghe, in his capacity as the subject minister of National Policies and Economic Affairs presented a cabinet paper to get US$210 million from Asian Development Bank to carry out certain construction work in tunnels, channels and reservoirs in connection with Moragahakanda and Kalu Ganga projects. This too was approved by the cabinet. On 5th December 2017 President Maithripala Sirisena in his capacity as the Minister of Mahaweli Development presented a cabinet paper to get US$ 210 million from Asian Development Bank for certain construction work connected with Moragahakanda and Kalu Ganga projects. This cabinet paper too received cabinet approval. Attempting to get US$ 470.5 million for the same construction work in the same project within a period of one month by both President Sirisena and Prime Minister Wickremesinghe indicates the contest between the two to claim ownership for the project say, political analysts. The reports on the project indicate that the amount of loans the President and the Prime Minister have obtained is nearly Rs.66,780 million.